Two summers ago, I spent a lovely few days visiting my dear friend Denise in East Hampton. I wrote about that visit in my, oh so wittily titled, ‘Life is a Beach’ post. Last summer, on a short trip back to the East Coast I invited myself back to the Hamptons. I spent less than 24 hours there, but what an adventure I had. Denise and I became good friends in Darien years ago, through our shared loves of cooking and gardening. We met through the Greenhouse Group at the Darien Community Centre (DCA), where we planted, watered and generally grew things together. When I started offering afternoon teas at the DCA, Denise was right there with me from the start. With her superior napkin folding skills, front of house management expertise and rather excellent chocolate cakes, she was one of my fabulous girls. Denise moved to East Hampton around about the same time I moved to Copenhagen. As I said in my ‘Life is a beach’ post, The Hamptons is where New York goes to play in the summer. Think Great Gatsby mansions, streets full of designer and speciality shops and art galleries selling pictures by artists whose name you recognise. Unlike many of the other towns, residents in East Hampton tend to stick around all year so it has more of a residential feel. When I went to see her two summers ago, Denise had already immersed herself in her new community. She had found a great little job working on a darling organic farm called Amber Waves Farms, she was their girl Friday. Denise also managed to find time to volunteer at the local thrift shop, the wonderfully named Ladies Village Improvement Society. All while I was still slightly floundering in my new home in Denmark’s capital city. Denise showing me the seeding machine at Amber Waves Farm. Denise has a gorgeous property in East Hampton. It has everything you would wish for in that rather wonderful part of the world, a pool with a pool house, a wrap around porch and fabulous neighbours. One of the neighbours, a young slip of a lass called Lidey, turned out to be an assistant to Ina Garten. In the culinary world of home cooks, it does not get any more exciting than being one step removed from America’s favourite celebrity chef. (For the non Americans who is) Ina Garten? Forty years ago, with no professional culinary training, Ina impulsively bought a small catering business in the Hamptons. Love her already! The store was named ‘The Barefoot Contessa’, after the film starring Ava Gardner. It was very successful. 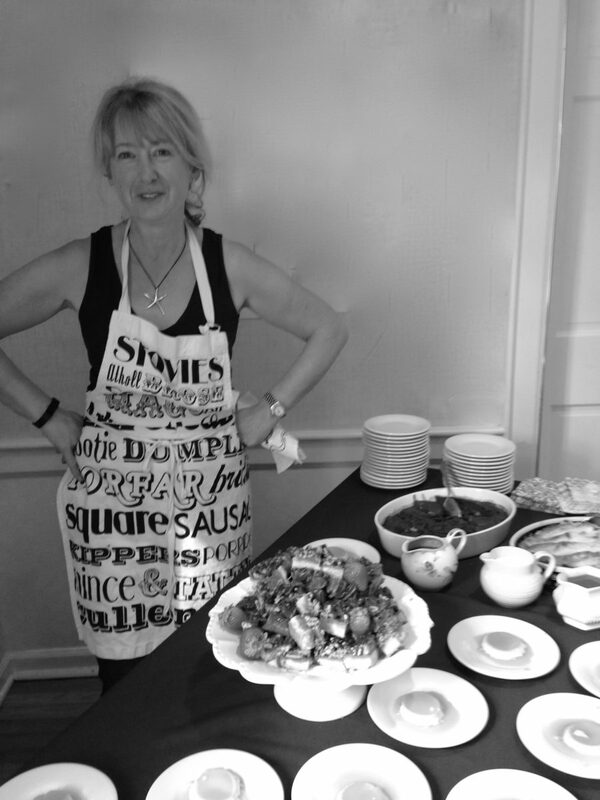 Ina then decided, after twenty years, to change careers, and started writing cook books. Her book, ‘Family Style’ was the first book I bought in America. In our new world of online recipes, where no one buys books, Ina writes a book every two years and each one is a bestseller. The books contain real recipes and beautiful photographs. Recipes you can trust. Ina has recently published her 11th book, “Cook like a Pro” . Her Roasted Eggplant Parmesan is already an extended family favourite having appeared several times over the holidays. Eggplant and goat cheese parmesan cooked by Denise! I own seven books so far, and may just have to collect them all. When I was catering my afternoon teas I served her Lemon Bars and Expresso Brownies! Can you tell I am a fan? Not long after my first visit Denise phoned to tell me she had a new job. Lidey, her neighbour, had told her that Ina was looking for a new assistant. Lidey suggested Denise apply and SHE GOT THE POSITION! I was beyond excited for Denise. She was already the poster girl for how to successfully start in a new town and now she was proving my long held belief that if you stick to being who you truly are, in her case Fabulous, then good things happen. We now had an up close and personal view of life in the fast lane, with pictures of behind the scenes at ‘Hamilton’ and tours of Ina’s private gardens. The next thing I hear is that Denise is back at Amber Waves Farm, but this time she is heading up the kitchen! With Ina’s blessing, and a few of her small kitchen appliances, Denise had started running the bakery on the farm. Did I mention that the farm has customers like Uncle Paul (McCartney) and the Clintons? Denise was living my dream life and I had to go and see her in action. I finally succeeded in organising a trip to the east coast at the end of last summer, and planned to spend a day working with her in the Amber Waves Farm kitchen. and delivering it to the Barn, Ina’s home in East Hampton. Well, she was supervising the making of it by her lovely assistant Meg. Denise suggested that I come and help with the delivery and maybe I would meet Ina herself. Sadly, I already had plans and could only come later in the evening. When I did arrive, I found dinner waiting for me on the porch, my first taste of the Roasted Eggplant Parmesan, and it was delicious. Later in the evening, Lidey, the neighbour dropped by after an evening of playing bridge with Ina (Bridge is my other great love). Lidey was an absolute delight and we chatted about recipes for millennials, her idea for a cook book. My contribution was to serve hot sauce on everything and offer at least three versions of roasted Brussel sprouts. Denise told Lidey that the next day we planning to bake together on the farm and with any luck would make a batch of chocolate caramel squares or millionaire shortbread. Lidey asked that we save some for her! Denise’s day starts early, so the mist was still floating over the fields as we arrived at the start of another hot day at the farm. I had loved being back in Darien, and had driven everywhere with a smile on my face. As I drove through the backroads of the Hamptons however, I was laughing out loud. It was unbelievably gorgeous. We even saw a family of deer, out for their early morning run. As fast as we made them, they were flying off the shelves. Denise also makes scones, chocolate chip cookies and salted peanut butter cookies, all recipes developed by her, clever girl! The baked goods sat beautifully next to the fresh fruit and vegetable displays in the farm shop. We had a good morning, and Lidey even popped by to say hi on her way to work. Once the morning madness was over, Denise asked me if I would make the millionaire shortbread. There was a heat advisory that day, the kitchen was not air conditioned and I thought I was going to melt as I stood over the stove making caramel. Finally, I finished one tray and put it in the walk in fridge to set. I almost stayed in the fridge with it! I was so impressed with the systems Denise had set up in her new kingdom, which she shares with chef Jack. The farm was very busy and the baked goods were selling like, well, like hot cakes! With her lovely young assistant Meg, Denise had risen to the challenge and figured out how to produce gorgeous home bakes on a commercial scale. Day after day! I was melting in the heat, totally frizzed and starting to think about leaving for the airport when Denise asked me to bring the shortbread through to the front of the shop so everyone could do a tasting. As I walked into the shop I saw a familiar figure, signature blue demin shirt and hat. Ina Garten had come to visit. As I walked forward to be introduced I could feel myself starting to bob a curtsey. Ina, however, leaned forward and hugged me as she said hi. I then started to speak absolute rubbish, the usual stuff she must hear every time she meets someone. How I was a big fan, had all her cook books and on and on. Ina always comes across as totally lovely in her television shows. Can I say, that she is even more gracious in real life. She engaged in a real conversation about cakes and I have a horrible memory of talking over her in my excitement. All met with ease and charm. And then Denise asked me to cut the chocolate caramel squares so everyone could taste them. I held my breath as Ina (and Lidey) tasted my morning’s efforts. Now, it turns out that Ina had never tasted them before. She really liked them. We had a brief discussion and added a little Malden Sea salt to the chocolate as the butter I had used that day was unsalted. Even better. In fact, Ina liked the millionaire shortbread so much, she said she might include the recipe in her next cook book! Did I have it written down somewhere? I sheepishly admitted to my website and to be honest really cannot remember much of the conversation after that as I was so excited. Billionaires are everywhere in the Hamptons, but there is only one place to buy Billionaire Shortbread! I had the good grace to thank Lidey. She had suggested the detour to the farm, knowing that we were baking chocolate caramel squares. And to thank Denise for a wonderful day. The recipe may never appear,, but that’s okay. I met one of my great heroes and had the chance to let her try one of my signature bakes. And she hugged me twice. It really does not get much better than that! Oh wow I’m so jealous! I love Ina Garten, how fun for you! Its a very special place! I know you are from my ‘hood’. Hoping to use you as a resource for liking NYC!